Gift certificates are regular products and follow the rules (store front design, shipping, tax, etc.) as any other product. Log in to the admin panel and browse to Settings > Marketing > Gift Certificates. Gift Certificates codes are randomly generated. You can generate by using the New button on the Gift Certificate List page. A gift certificate will also create after payment is received for a Gift Certificate product. For Security reasons, the gift certificate code should be difficult to guess. Random characters will replace the bracketed values upon gift certificate creation. "A" means alpha only, "N" means numeric only, while "AN" means alphanumeric. The number in the brackets indicates the length for the bracketed value. Any characters outside of the brackets are left as-is. [A,3] means an alphabetic combination 3 characters length. [AN,4] means an alphanumberic (mixture of alphabets and numbers) combination 4 characters in length. Default Expiration Timespan In Days: Using this option will cause all gift certificates to expire after the set number of days after activation. Pending – This Gift Certificate has not been assigned to a Customer. Active – This Gift Certificate has been assigned to a Customer. Cancelled – This Gift Certificate is no longer valid or usable. The status does not automatically change after the Gift Certificate expires. A gift certificate type is a way to identify gift certificates generated for specific purposes. 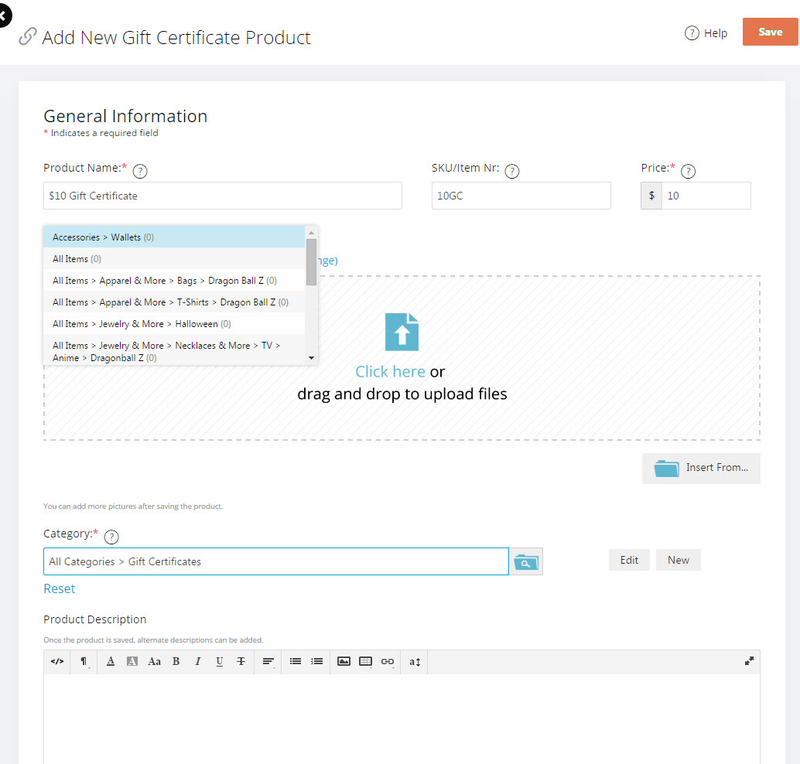 For example, a gift certificate generated by a customer placing an order has the stores' default type. A manually created certificate might be for a refund, so the type would be "Refund". Purchaser Email Template: Sent to the person who bought the certificates. This sends when the certificate is paid. Recipient Email Template When Purchased: Sent to the email address specified in the Recipient Email field if coming from an order. Recipient Email Template When Generated: Sent to the address specified in the Recipient Email field. Only used if the certificate was generated by a store admin. Send Gift Certificate Email When Set To Active Status: Send the email when status is set to active. As mentioned earlier, the gift certificate behaves just like any other product. However, the path to creating it is slightly different. A screen titled Add New Product > Gift Certificate will open. Fields marked with a red * are mandatory on this page. Note: You must follow these steps when creating gift certificate products. If you create a product directly in the Catalog the product will not be flagged as a gift certificate. Once you have entered all the information on this page click on Save. You can create multiple gift certificates following the steps above. Upon saving, the gift certificate is ready for use by your customers. Note: Do not modify these options. You can add more options if you wish and change the sort order but do not change the names of the predefined fields or the merge codes will not work. By default, the above three fields are optional. If you wish you can enable the Is Required checkbox to make them mandatory. This is helpful when your store allows for adding to cart from the category page. If the variants are not set to Is Required the information will not be requested. A batch is a way to generate gift certificates en masse. This is useful when you want to generate a large number of gift certificates to distribute. Note that fields marked with a * are mandatory on this form. 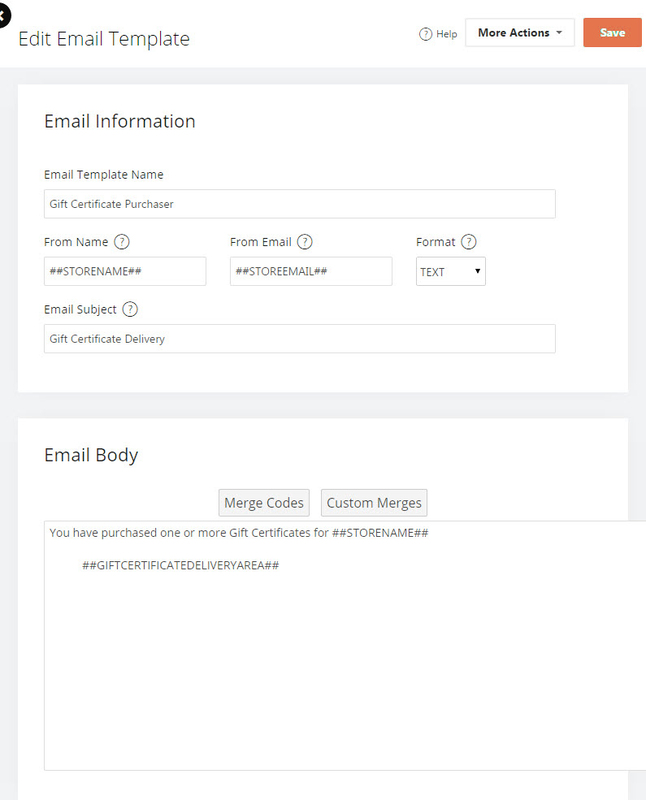 After Step 2 you can choose to make changes to the default email templates for the gift certificates. Browse to Marketing > Email Templates, then select Gift Certificate Purchaser or Gift Certificate Recipient. Obtained from the optional personalization fields on the Gift Certificate eProduct or on the Gift Certificate Edit screen. 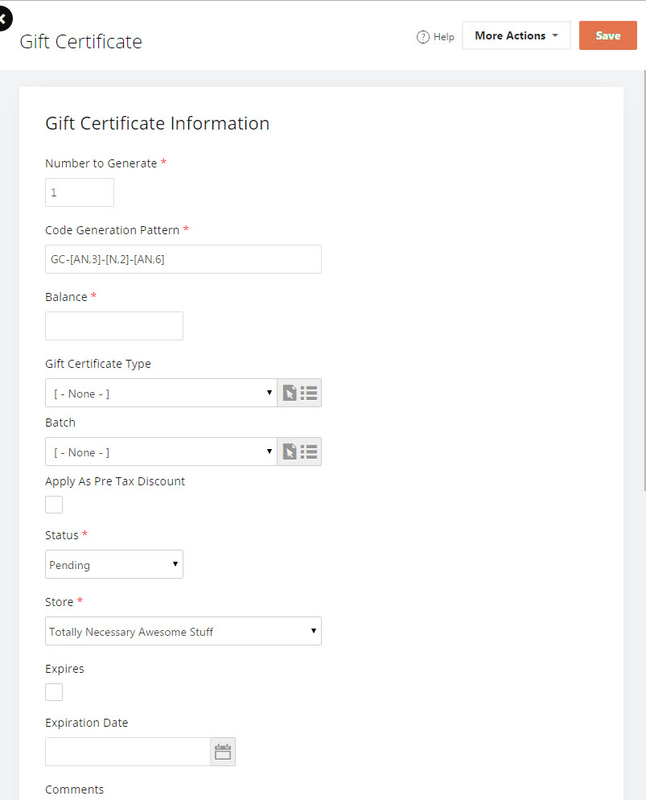 Lists all gift certificate codes in a comma separated format. Can be used to send multiple codes to a customer via an email template. To read more about email templates please click here. There are some things that you need to bear in mind when working with gift certificates. If enabled, the Gift Certificate applies as a Discount on the order to the subtotal and shipping amount before tax is calculated. A batch is a custom way to identify gift certificates generated en masse. For example, providing a list of Gift Certificates for promotional purposes. 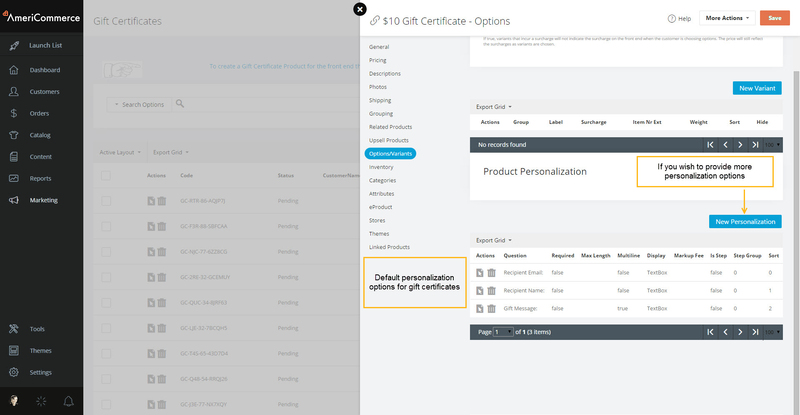 If a Recipient already exists on your store as a customer then the gift certificate automatically assign to that customer. Other customers cannot use this. Gift Certificates will be generated in the denomination of the product when bought online. Standard Gift Certificates will artificially inflate the sales figures for the store. The sale will register both when the Certificate is purchased, and again when redeeme. The certificates are simply a form of payment like Credit Cards. The default type is a standard Gift Certificate / Gift Card with a balance. This type is applied as a payment method in the same way Credit Cards would be applied. Someone purchasing a Gift Certificate would obtain a Gift Certificate in the same denomination that they spent on the product. The Gift Certificate should be a Non-Taxed item. Standard Gift Certificates are debited before any other payment methods. If the order has an outstanding balance after all Gift Certificates apply, other payment methods are available to collect the balance. Standard Gift Certificates are applied after taxes. This type of Gift Certificate is applied as a discount to the order, after shipping and before tax. These apply like a coupon code that carries a balance. These types of Gift Certificates are used for promotional purposes and are given to the customer “without consideration”, meaning they didn’t pay for them, so they are applied pre-tax since the customer wouldn’t pay tax on something they were given for free. The order for the gift card/certificate has to be closed and the certificate has to be set as active. If the gift card or certificate is registered to an email address, the customer will need to enter that same address to use the certificate. If the email address is already registered, the customer will need to log in. 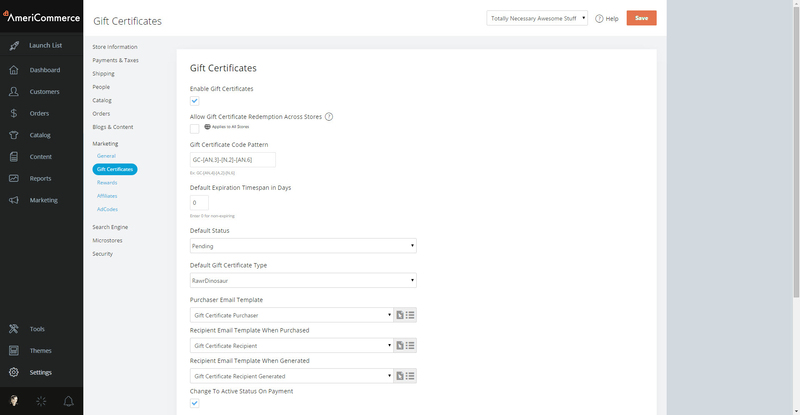 Once logged in, a list of certificates registered to them will be displayed in a drop down box. Is there any way to let customers check their gift card balances or have their remaining gift card balance show up in their accounts online? I'd like to repeat Trevia's question above? Do customers have any way to find out their remaining balance without having to contact us? What is the check box - "Allow Gift Certificates to be assigned to purchaser"? Does that mean purchaser can buy gift certificate for him/herself to be assigned to their own customer account?